This week the Mayor of Brighton and Hove, Councillor Geoffrey Wells hosted a reception in the Mayor’s Parlour to mark the retirement of Councillor Pat Drake after 40 years service to the community. Councillor Pat Drake was born in Brighton in 1935 and educated at Lourdes Convent and Brighton & Hove High School GPDST. She spent most of her working life as an accountant, working for 18 years as an accountancy tax practitioner, and maintaining for 15 years her own private practice. She has worked in local government since 1971, with Brighton Borough, East Sussex County and Brighton & Hove City Councils. Pat was elected to serve as a councillor for Westdene Ward, which was re-named Withdean, in 1997. Her hard work and commitment to serving the community she represented, made her a well respected and popular councillor amongst her constituents. She will be sadly missed by the community in Withdean. 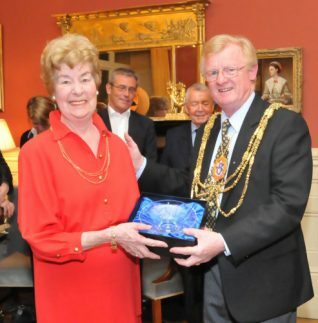 During her term of office as Mayor of Brighton and Hove in 2004/2005, Pat set up and opened the Old Police Cells Museum – the Museum of Sussex Police, which is located in Brighton Town Hall. In 2006 she made a successful bid for a £10,000 lottery award to expand the museum from three to thirteen cells. The project has since gone from strength to strength and now has in excess of 2,000 visitors a year in escorted parties. Pat has also, over the years, been an active member of a number of local preservation societies and community associations as well as the National Trust. In 2004 she joined the Rotary Club of Brighton which is the oldest town club outside America (founded in 1913). She was elected the first woman President of the Rotary Club in 2008, and awarded the Paul Harris Fellowship in 2010. We join with her friends and colleagues to wish Pat Drake a happy and healthy retirement.